The TAG Heuer Men’s Link Calibre S Chronograph Watch CJF7112.BA0596 is a refined piece of mechanical work with quality and luxury design. The bidirectional system in place allows this watch to measure time both mechanically and electronically. 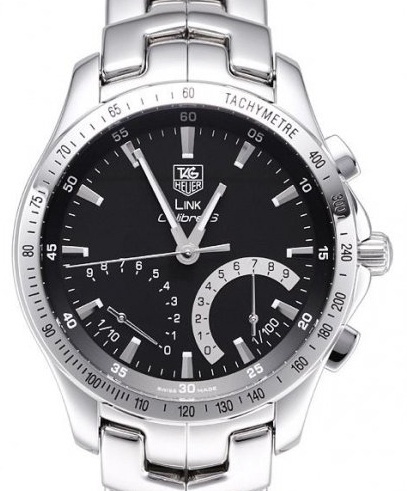 This enables the Link Calibre S to transition between time functions and perform at a high standard of excellence. The Link Calibre S series features a multi-dial system to display the chronograph and calendar. Hybrid electronic and automatic powered movement. A Swiss Chronograph with two sub-dials. 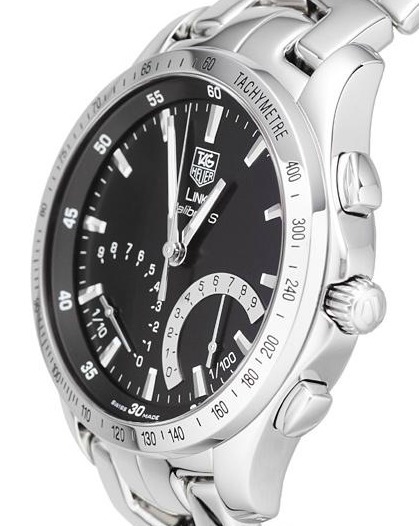 A Tachymeter bezel for gauging speed by conversions of time. Push switch crowns to shift between Chronograph and Time functions. Two sub-dials that display the Perpetual Calendar. A case and bracelet made of polished steel. The CJF7112.BA0596 is a hybrid of two movement technologies between a pendulum rotor and a quartz powered battery. The rotor mechanism winds the watch with the oscillation of the wearer’s movement. When not worn, the quartz battery picks up the slack with its electronic movement, ensuring that the watch is consistently in time. The TAG Heuer Link Caliber S is ideal for men with active lifestyles due to its numerous timing mechanisms and hybrid power sources. Bidirectional motors inside the watch allows for quick transfer between the two modes of time keeping. When in Time Mode, the center hands display the current time while the two adjacent sub-dials display the perpetual calendar, with guaranteed accuracy until 2099. Using the push-in crown functions, the watch can quickly switch to the Chronograph Mode. In this mode the center dial displays elapsed time while the two sub-dials further track time down to the 1/100th second. The Tachymeter bezel is made to measure the speed of objects by the conversion of time, making this an ideal personal watch when timing events or while down at the racetrack. Additional features include luminescent markers along the dial for clear viewing in low light areas and sapphire crystal plating for enduring protection. The case and buckle are made of polished steel while the deployment buckle in the back displays the TAG Heuer etched logo. The watch is water resistant up to 200 M but even so, it relies on a rubber seal to keep its many moving parts protected. Over time the seal may become worn, revealing gears to potential danger. As with any watch, it is best to take your watch to a repair technician rather than spoil the investment of such a luxury appliance. The Link Caliber S offers a range of features that makes it exceptional and at an average luxury price of $2,500, you can be sure that your money is being well spent on a true quality watch.